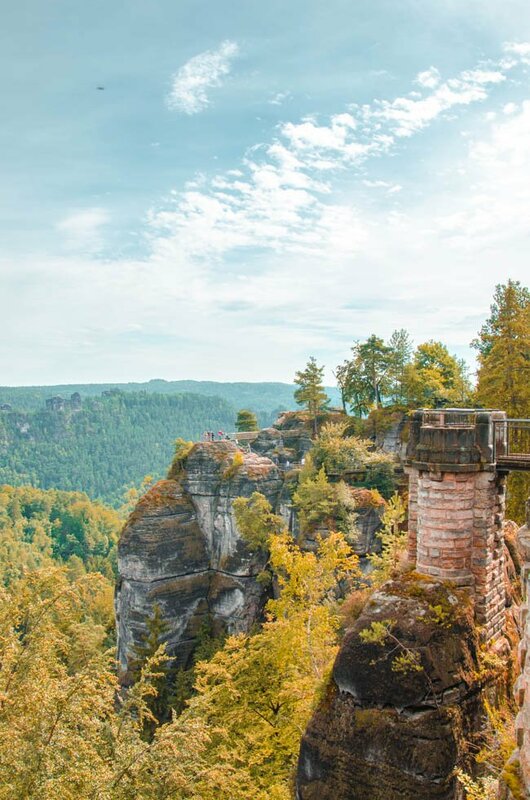 Deep in the Saxonian forests, reigning high atop magical rock formations rising like claws into the sky can you find it, the fairy tale like but very real Bastei bridge. Its origin is as magical as its surrounding landscape. 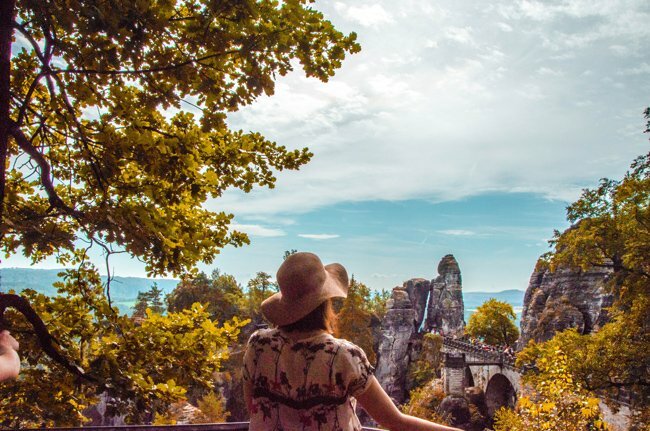 For over 200 years, it has been quite the local German tourist attraction but when a wooden bridge was constructed in 1824, combining several rock towers, visitors came flocking. 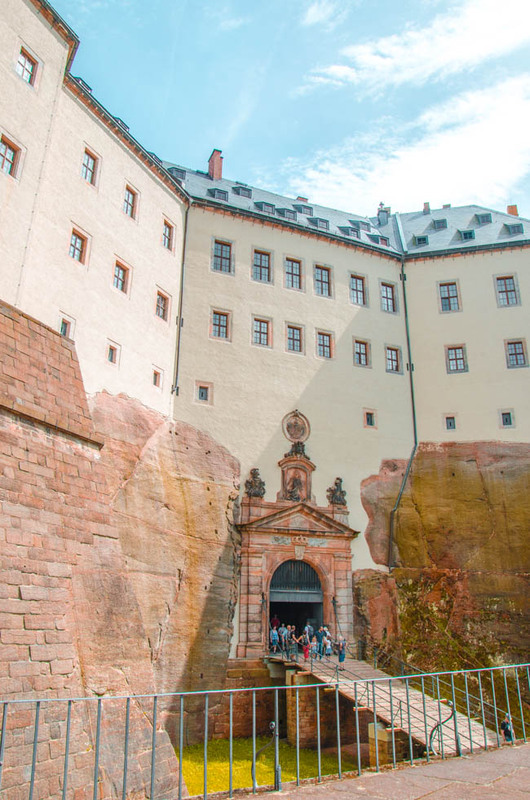 About 27 years later, it was replaced by limestone and made into what it is today: A perfect day trip destination from Dresden. 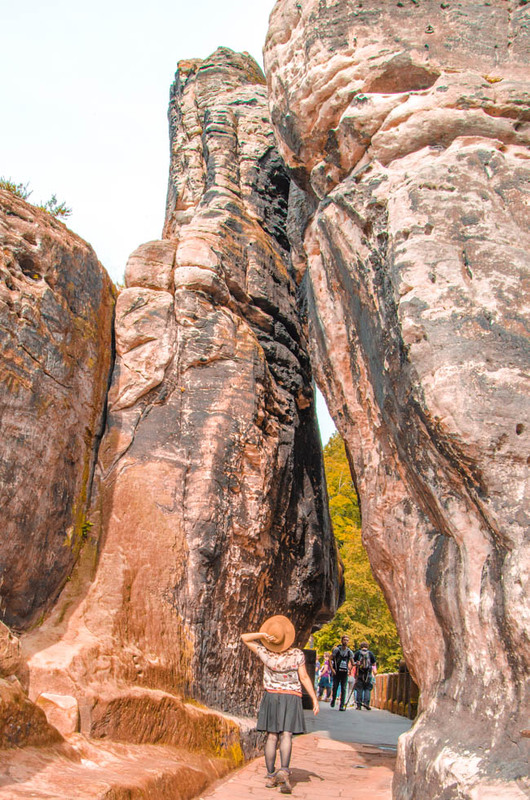 While the first mention of the Bastei was listed in 1592 during a land survey, the natural rock formations have attracted attention long before. They were utilised as a defence ring for Neurathen Castle, which was carved right into the rocks. Then, when famous German painter Caspar David Friedrich immortalised the “Rock gorge” (“Felsenschlucht”), its fame was only fuelled. 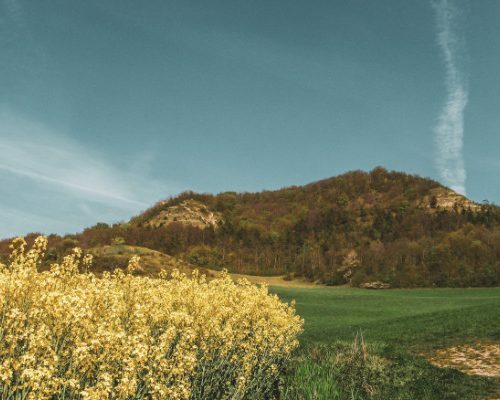 Nowadays it has a height of 194 metres above the Elbe River and you can see all around the Elbe Sandstone Mountains and over to the Koenigstein fortress as well. The views from here are absolute stunners! From Dresden, you can take the train S1 towards Schöna and get off at Kurort Rathen, where you can take the ferry across the river. From there, you have to walk up the mountain. Another option is to jump on bus 237 from Pirna towards Sebnitz and get off at Bastei. Your third altnerative is taking the bus from the marketplace of the town Wehlen. It takes roughly an hour to reach the Bastei bridge from Dresden. You can either take the A17, which is the fastest option (no speed limit) or B6 (100km/h speed limit) via Lohmen. When using a GPS system, use the address “01847 Lohmen” or coordinates with a degree of latitude 50.9665139 and degree of longitude 14.0657333. 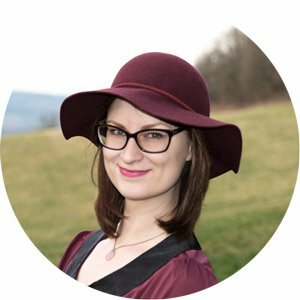 You need to park your car in one of the two parking lots, either right at the beginning of Basteistraße behind the gas station or further on. Car parking up to 3 hours costs 3€. Any longer than that is 5,50€. Follow the signs to get to the Bastei Bridge. The walk isn’t long at all. 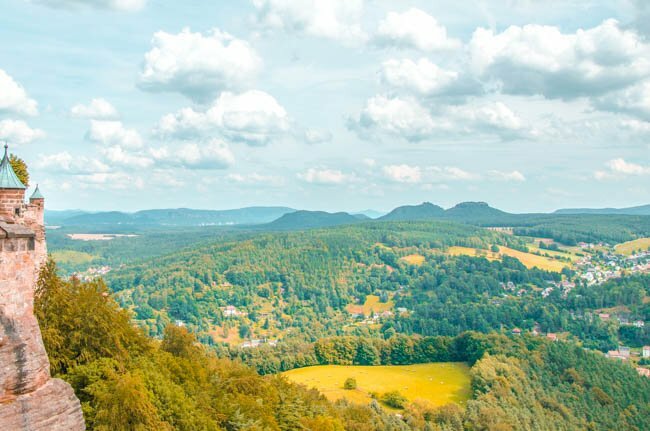 Each season has its own charm when it comes to Saxon Switzerland. 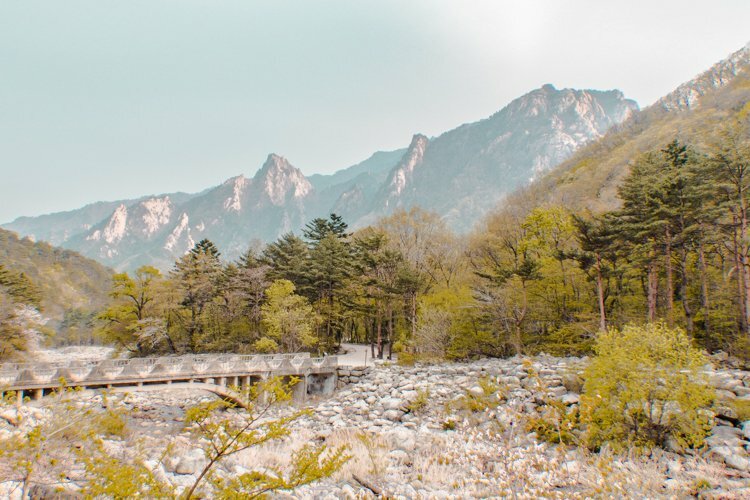 Try opting for late spring for all fresh green to sprout from the mountain forests. Otherwise, check your calendar for early autumn, which is when the German summer realises he has been late in coming and days gets warm. Plus, it is off season and summer holidays are over, which means that the crowds will have ebbed away. Late autumn until early spring is usually a dreary time in Germany but if there has been snowfall, you will be in for a treat! (Just be really careful and don’t forget winter wheels and sturdy winter boots.) 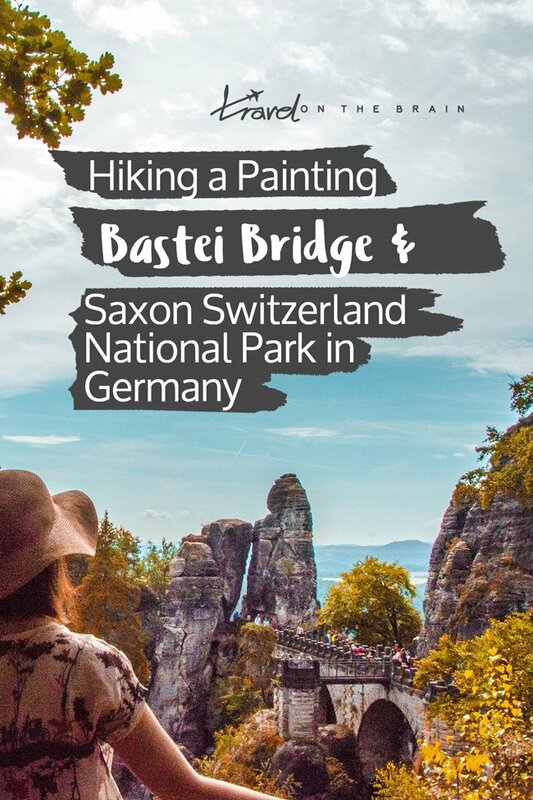 If you can arrange it, avoid visiting the Bastei bridge during the weekends as locals visit for a city break. Getting from the parking lot to the Bastei bridge is easy as pie. The walk is even and level and not challenging at all. Once you start heading down the starts behind the bridge or plan on hitting the hiking trails around, you need to adjust your wardrobe. 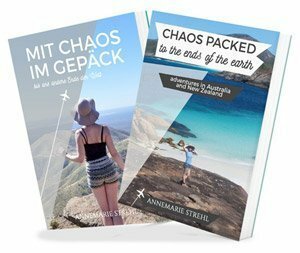 Germans love hiking (and wearing outdoors clothes unapologetically on any given day), why not bring your Lowa hiking boots and Jack Wolfskin all weather jacket? The key is layer looks so you can adjust your temperature and don’t get too sweaty or cold. Winds can pick up up on the Bastei bridge and it can get slightly chilly in the forests (which great on a hot summer’s day). For your camera gear, strapping on a gopro to capture your outdoor adventures on the go might be a fun idea. Drones aren’t allowed unless you have written permission. If you are starving and want easy access to food, why not enjoy the panorama restaurant at the Bastei? You can find it inside the Berghotel Bastei (where you can stay overnight). Pick a seat at the windows for grand views over the Saxon Switzerland. You cannot possibly hike the Bohemian and Saxon Switzerland National Park without proper energy. Typical Saxon dishes to try are local dumplings (don’t get them mixed up with Thuringian dumplings) with cabbage and meat, potato soup with sausage, sauerbraten (marinated pot roast) for hearty delights. For your sweet tooth, try the cake Dresdner Eierschecke or stollen in winter. The entire area offers a lot of hiking potential and around Dresden, you can visit fairy tale castles. 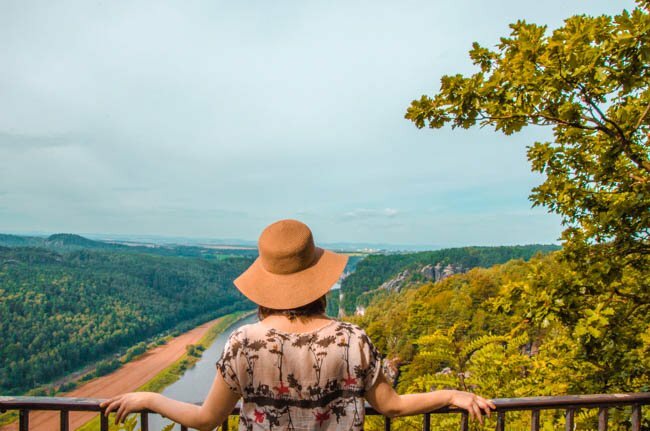 The classic combination for a day trip to the Saxon Switzerland is hiking the Bastei and then strolling around the Lilienstein mountain and Koenigstein fortress. This is a very unique fortress that has never been seized thanks to its strategic location. It sits snug on its own rock and can only be entered through one drawbridge. Over the course of history, it has had many function. Fortress for defense, residence for nearby aristocrats and their vassals, prison and then again bunker during WWII. Nowadays, you can book yourself into the youth hostel, visit the museum or dine out with spectacular views. Festivals and events are held regularly as well. 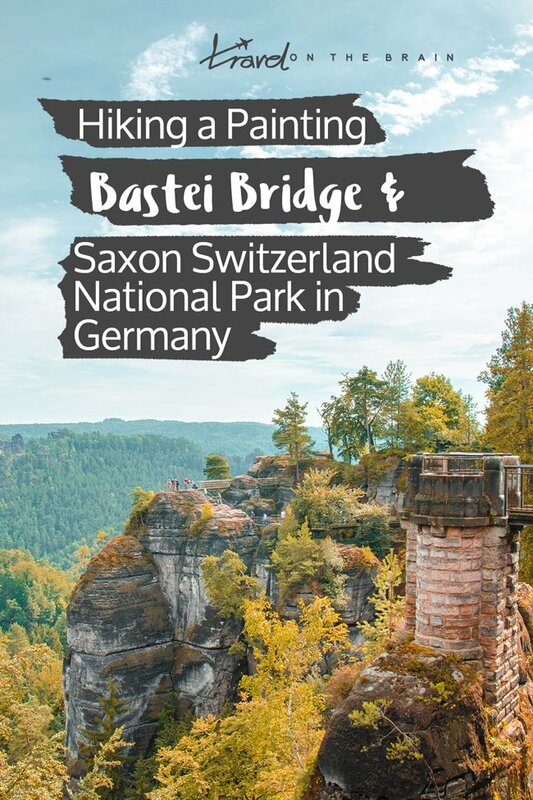 Should You Visit Saxon Switzerland? This is one of the most picturesque areas within Germany and is easily reached – especially with car. If you are staying in Dresden, planning a day trip to the Bastei Bridge is highly recommended. The pictures speak for themselves. It really is that scenic. Tell me: Have you ever heard of Bastei Bridge before and would you want to visit?